Kimberly Banks Fawcett joins us in the fresh new episode of the DistressedPro Professionals Podcast! 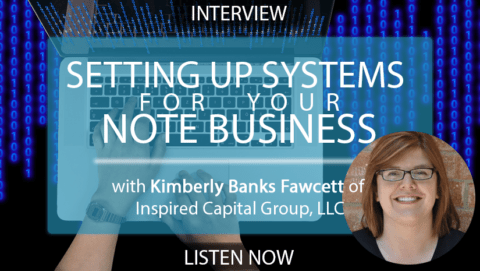 Listen and learn about her experience with getting started in mortgage notes, best and worst-case scenarios, and the systems she uses to stay profitable. Kimberly, of Inspired Capital Group, says she was fortunate enough to be born into a real estate family. She went her own way first as most teens do, but just 3 months out of college she purchased her first rental property. Her education continued while she grew and managed her rental property portfolio. Kimberly says that it was at a local REIA meeting when the spark of inspiration came. The realization that no one calls their lender when the toilet gets clogged was her ‘a-ha moment’. Ever since then, she has focused on note investing instead of property management. Contrary to other areas of real estate, Kimberly has found the note community to be far more helpful and willing to share. You should join and be active in communities both online and in person for growth. She also recommends mentoring as a way to hack success quickly. Expert Scott Carson introduced Kimberly to DistressedPro and her first note deal. She acquired 2 condos in Florida for around 40% of value. Once the foreclosure process was over, she flipped the properties successfully. and what happened when a flip house which was vandalized the weekend before closing. As a portfolio manager at Inspired Capital, Kimberly manages investments in residential and commercial mortgage notes, with a focus on first liens. Learn about the types of risks she takes with her own investments and her goals when investing with other people’s money. Learn her keys to keeping a solid pipeline, minimizing risk, and maximizing the potential of note investing. She explains, as you scale past 4-10 notes, spreadsheets aren’t typically enough to avoid missing critical payments and keep the deals flowing. You need systems– which means organization, integration, and automation, for long term success. Find out what she uses and why. Wow, that would be great.. if I’m up to my eyeballs in debt can I also do notes? What is the minimum amount one person can start with? You can play the role of a broker and invest nothing… If you are looking to purchase a note yourself, aim for a minimum of 10K… Nothing is set in stone, notes have sold for less, some people pool money on these investments… There are many ways to be involved in the note business, with or without investment capital. Property taxes run with the land so after foreclosure the property taxes are the responsibility of the new owner. If that owner is the bank then the back is responsible. Why do you have a landing page with audio content that’s not available? Stupid ! We make our audio content available for free to public for a month and then the interviews go in the vault and are for paid members. Sorry if that’s frustrating. Enter Your Best Email. It's Where We'll Send the Download.